sheet pan Chicken Fajitas are the perfect quick and easy weeknight dinner! 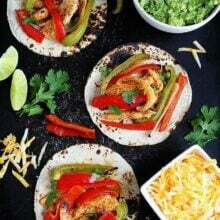 This flavorful Fajita recipe combines Marinated Chicken, peppers, onion, and a mix of seasonings. It is a family favorite! Fajitas are one of our all-time favorite Mexican meals. We love ordering sizzling fajitas when we go out to eat at our favorite Mexican restaurant, but since we don’t go out to eat that much, we decided to bring the fajita party home! 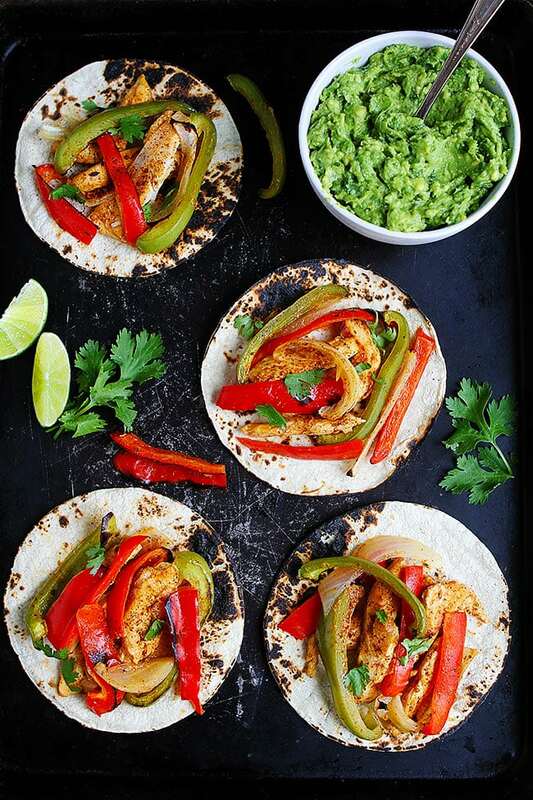 These homemade Chicken Fajitas are easy to make in your kitchen and much better than any restaurant fajitas because they are healthy and SO delicious! 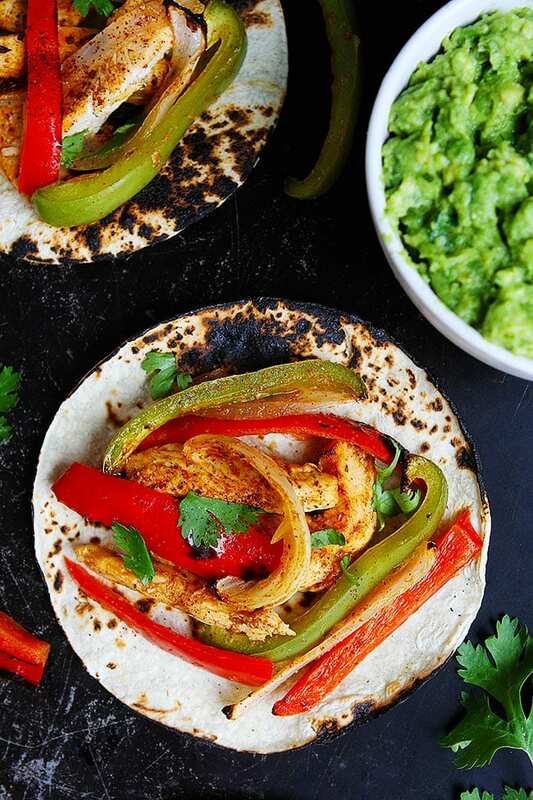 This chicken fajita recipe is from Gina’s new cookbook, Skinnytaste One and Done. The cookbook is filled with dinner recipes that are all made in ONE pot or pan, which is genius because we are all looking for easy dinner recipes that require little clean up! Cooking at home doesn’t have to be hard, you can still get big results with little effort. 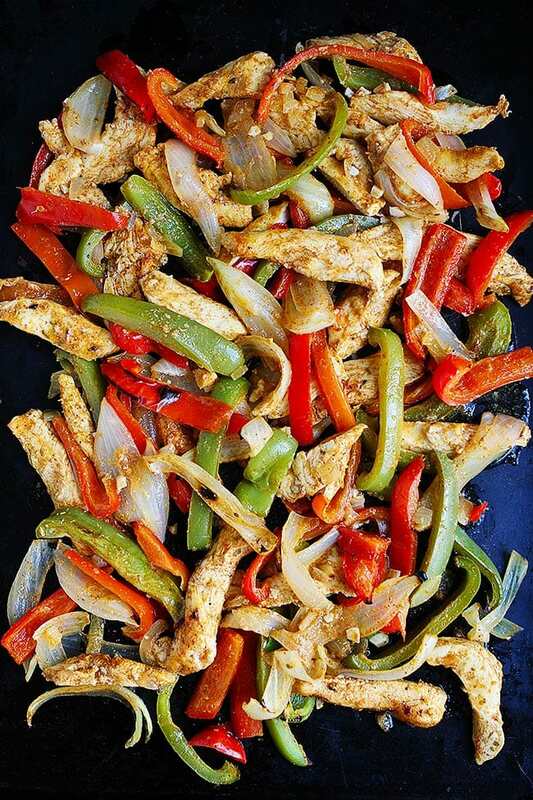 For example, these homemade chicken fajitas are SO easy, you only need one pan. You are going to love these sheet pan chicken fajitas. The boys favorite fajitas are chicken fajitas, so when they saw Gina’s recipe in her new cookbook, they put them on our weekly meal chart! They couldn’t wait for fajita night! 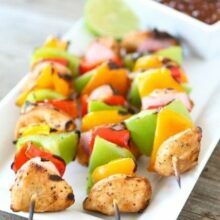 This marinade is loaded with flavor and keeps the chicken tender and juicy. The pineapple juice is a game changer, it adds a nice sweetness and flavor. You are going to LOVE this chicken fajita recipe because you make the fajitas in the oven on ONE big sheet pan! First, marinate the chicken in the refrigerator for at least one hour. You can marinate it overnight, so this is a good meal prep recipe. You can have it prepped and ready to go! When the chicken is ready, the fajitas only take 20 minutes make. While the chicken is marinating, you can cut the peppers and onions into strips. To make the fajitas, put the chicken and vegetables on one large sheet pan. If you want to make the clean up even easier, you can line the pan with foil and spray it with nonstick cooking spray. Cook the chicken and vegetables for 15 minutes at 400 degrees F. Remove the pan from the oven and turn the oven to broil. Put the pan back into the oven on the top rack and broil for 4-5 minutes or until the vegetables are slightly charred and the chicken is cooked through. Don’t skip the broiling step, it will give the fajitas that sizzling flavor. When the chicken and vegetables are done, you can char your tortillas right in the oven. We like to use corn tortillas, but if flour are your favorite you can use flour tortillas. What Do You Serve With Chicken Fajitas? Go crazy and let your family and friends build their own fajitas! This is a fun meal to make and eat! And make sure you check out Skinnytaste One and Done for more easy and healthy dinner ideas! 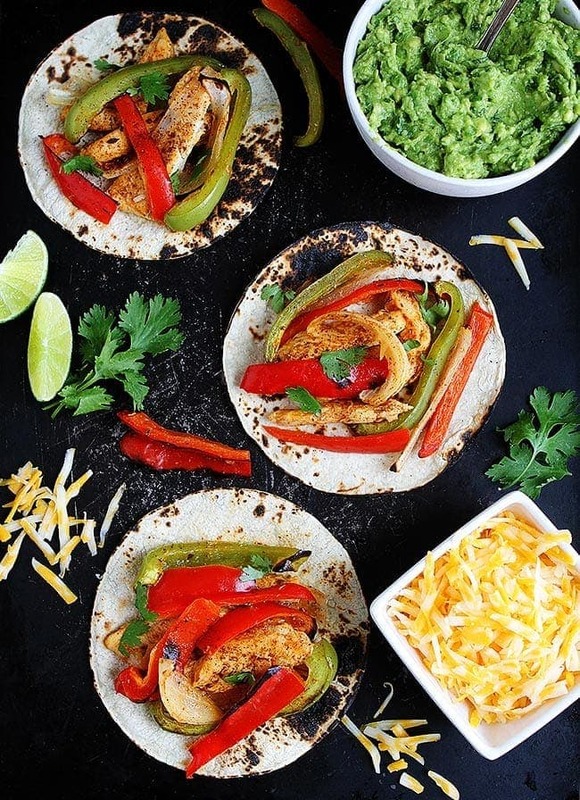 These easy chicken fajitas make the perfect quick and easy weeknight dinner! For the chicken and vegetables: In a liquid measuring cup, whisk together the pineapple juice, lime zest, lime juice, olive oil, onion, garlic, chili powder, cumin, oregano, smoked paprika, and 1/2 teaspoon of the salt. Place the chicken in a large zip-top plastic bag and add the marinade. Massage the marinade into the chicken, making sure to evenly coat all the pieces. Refrigerate for at least 1 hour or as long as overnight. 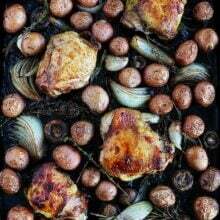 Adjust an oven rack in the center and another 4 to 6 inches from the broiler and preheat the oven to 400 degrees F. Spray a large rimmed sheet pan with oil and set aside (you can also line it with foil, then spray). Remove the chicken from the marinade, shaking off any excess, and place it on the prepared pan. 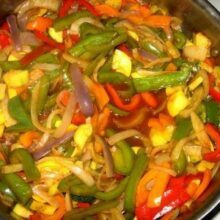 Pour the marinade into a large bowl, add the bell peppers and onion, and toss well. Spread the vegetables evenly on the pan around the chicken and sprinkle with the remaining 1/2 teaspoon salt and pepper to taste. Toss to coat and spread out evenly in the pan. Switch the oven to high broil. Give the vegetables and chicken a good toss, move to the top rack, and broil until the vegetables and chicken are slightly charred and the chicken is cooked through, 4 to 5 minutes. Remove the pan from the oven and transfer the chicken to a cutting board. Place the tortillas directly on the top oven rack and broil until warm and slightly charred, about 1 minute. Slice the chicken into small pieces and mix with the vegetables. To assemble, evenly distribute the chicken and vegetables among the tortillas. Top cheese and desired toppings. Serve warm. Yum! I totally need to make these for dinner one night this week! Fajitas are literally the OG easy sheet-pan dinner! 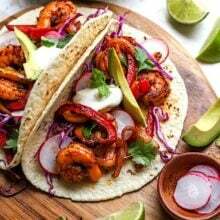 great recipe, I never make fajitas, only order them but love all of the ingredients and assembly options, wonderful inspiration too, thank you! These were delicious! The best fajita recipe I have tried. Thank you! Having new cuisines or dishes in the basket of a party or majlesi catering is a very good matter. Your great article really has done this to my case and It’s so much useful and mindful to my business online food order. Thank you all. Continue good job. It’s for a long time I’ve been looking for great and new recipes up until now I’ve come across your great article and site which was really clarifying to my business catering. Thank you very much team. It got me really nice ideas on new cuisines. Most of business caterings like us really enjoy helpful and useful texts like this one. Thank you very much you all team because of the great stuff you provided on the website. Thank you and resume your awesome job. Have a good time. I made these tonight and they were incredible! This recipe is a keeper. Prep is so easy and quick!